A night of glamour in the West End will start with your automatic table reservation at Le Restaurant de Paul Covent Gardens conveniently located just over 5 minutes walk from the Savoy Theatre where you will be regaled with the soothing tones of The Dreams and all the sequins and feathers of Hollywood. Dreamgirls has been a huge success on Broadway and one of the West End’s hottest shows since it opened. This is one show that's not to be missed! Dreamgirls follows a trio of women trying to make it big in the Chicago music industry. How much will they have to change and how many compromises will they have to make to fight their way to the top? 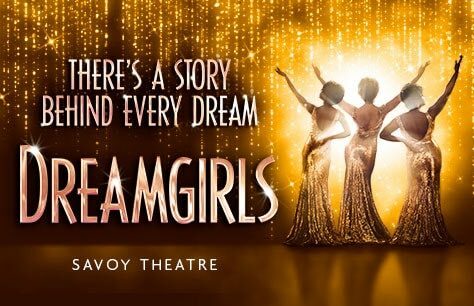 Dinner & Show tickets for Dreamgirls are here Book now to ensure your seats to this glitzy musical! Booking until 21 December 2018. Please note the appearance of any particular performer can not be guaranteed. Dreamgirls is a fun show, very well performed and staged; but suffers from the usual West End theatre malaise: over-amplification. The sound is so badly distorted that it is impossible to properly appreciate the performance. Pre-theatre dinner at Le Restaurant de Paul was good - although there seemed to be a staff shortage. The dinner was sinple, but very nice and the show was entertaining. It was not my favorite only because it's funner when you know the songs, but it was well done. The Theatre Direct dinner and show deal was a good deal for the money and the reservations on line plus pick-up at theatre went well.